The transition to ICD-10 will be challenging for the entire health care industry. Although the Centers for Medicare & Medicaid Services’ (CMS) deadline for implementation has been moved again, these delays have done little to blunt the changes that payers and providers will have to endure to implement the new coding system. To alleviate some of the pain, the Massachusetts Health Data Consortium (MHDC), working in partnership with the Massachusetts eHealth Collaborative (MAeHC) and Edifecs, has spearheaded the creation of a collaborative statewide testing program that promises to improve the effectiveness and lower the cost of ICD-10 implementation. Massachusetts has advantages over other parts of the United States that make large-scale ICD-10 implementation somewhat easier. For example, it’s a relatively small state geographically, but it features a high concentration of providers and payers. In addition, its major health plans, which account for more than 80% of all covered lives, are nonprofit entities focused principally on the Massachusetts market. There also is a long history of cooperation and collaboration among the state’s health care stakeholders. Still, the prospect of every payer having to organize and execute end-to-end testing with every provider poses significant challenges. In response to rising concerns about ICD-10 implementation challenges, the MHDC launched the ICD-10 Project in 2012 to provide a forum for stakeholders to raise concerns and identify opportunities to develop common or coordinated approaches to address these issues. Following many months of discussion, the stakeholders identified an opportunity to create a joint testing approach among payers and providers that would allow stakeholders to coordinate and align their preferred testing methods, actively share lessons learned to minimize the duplication of efforts, and share the cost of project management, subject matter expertise, and testing technology. This led to the July 2013 creation of the Collaborative Testing Program (CTP), a fully hosted product, service, and program management solution for providers, payers, and trading partners. Sponsored by the MHDC, the CTP enables transaction (syntax), coding quality, and business impact testing within Web-based, payer-sponsored testing communities that maximize the collaborative development and sharing of testing scenarios across communities while preserving the confidential contractual relationships between plans and providers. The CTP is governed by an executive steering committee composed of MHDC member payers, providers, government, and association information management executives. The MAeHC handles program management and implementation services, while Edifecs provides the testing technology. 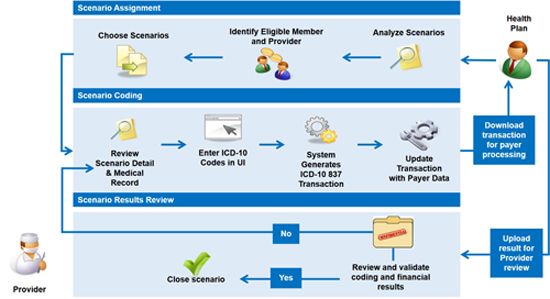 The testing program is organized around payer-specific testing communities, where the activities detailed in the graphic below take place between each payer and provider. • increased support for impact evaluation and adjudication with payers. • a transaction testing environment that ensures 5010 compliance and enables the testing of 837 and 835 transactions with provider and payer production systems. Currently, the CTP features 26 organizations (eight payers and 18 providers) participating in collaborative testing. These organizations represent 114 individual entities (83 health systems, 15 hospitals, nine health plans, six large medical groups, and one practice, clinic, or small group). All but one of the payer-sponsored testing communities has made significant progress, while the one remaining plan-sponsored community was scheduled to commence testing as this article went to press (see Table 1 below). • defer any discussions regarding post-October 1, 2014, testing until the CMS issues a formal rule on the new ICD-10 deadline and CTP best practices and automation opportunities are available to inform planning. The executive steering committee chose to maintain its ICD-10 course for several reasons. First, the return on investment is greater and the costs lower if the CTP is completed rather than extended or postponed. Also, other ICD-10 projects will benefit from the increased time, resources, and knowledge gained from a completed testing program. These projects include training, workflow redesign, physician education, network outreach, and clinical documentation improvement. In addition, testing has a longer shelf life than ICD-10 process improvements that require rapid transitions to practice, and the chances are remote of reassembling a testing collaboration at a later date that approaches the size and scope of the current CTP. The executive steering committee also advised participants that existing regulations require that plans and providers submit and process claims in ICD-9 until the CMS issues a formal rule specifying otherwise. An MHDC survey took stock of how CTP participants will handle the latest ICD-10 delay. Fifty-six percent of respondents planned to continue ICD-10 testing as planned with or without adjustments to other ICD-10 priorities. 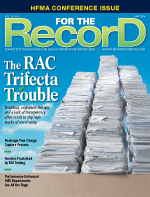 Another 24% planned to slow the pace of their ICD-10 testing. Seventeen percent still are assessing the impact of the delay on their ICD-10 testing and implementation plans. Only 2% planned to defer a substantial portion of their ICD-10 testing and implementation activities to 2015. Nearly two-thirds of the respondents indicated they already had started testing and would continue with the CTP. The remaining respondents were divided between the undecided and those who anticipated some delay in their testing start date. Respondents were divided about when they would complete ICD-10 testing, with 37% planning to complete testing by October 1, 2014; 34% uncertain as to when they would complete testing; and 27% planning to complete testing by the new implementation date. Thirty-seven percent noted major internal and external priorities would compete for their ICD-10 implementation resources and budgets. • History of collaboration: The MAeHC and the MHDC have established credibility by fostering and leveraging a strong level of collaboration among the state’s plans and providers to establish major IT and health data initiatives that would be difficult, if not impossible, to achieve individually. • Participant trust and initiative: The CTP was conceived and launched at the behest of the state’s major plans and providers. The initiative of participating plans and providers and their trust in the MAeHC and the MHDC provided the leadership endorsement, commitment, and funding essential to the program’s success. • Transparency: The MAeHC and the MHDC work closely and openly with the executive steering committee and CTP participants to provide credible, tangible, and candid progress reviews and to escalate and resolve planning and implementation issues as they arise. • Equity: Participating plans and providers split the cost of the CTP. Each plan and provider is assessed a funding contribution in direct proportion to its size. • Urgency: While the delay in ICD-10 implementation has diffused some of the urgency that came with an October 2014 deadline, all program participants recognize that the setback does not reduce the critical importance of testing. Rather, it enables them to adjust other ICD-10 priorities, such as training, documentation, and communications, to ensure that testing remains the priority. • Adaptability and flexibility: While a common, standardized testing program for plans and providers seems ideal, its success requires that diverse strategic and technological capacities and priorities be incorporated in its development and execution. • Getting to yes is only the beginning; execution is everything. Gaining agreement on participation, planning, strategy, and execution is a necessary but insufficient element of successful ICD-10 testing. Executing program milestones and achieving tangible goals ensure momentum and raise the participants’ level of knowledge and engagement. • One organization’s ICD-10 priorities are not another organization’s ICD-10 priorities. As outlined earlier, no two organizations share the same ICD-10 testing strategies, methods, expectations, priorities, and approaches. Working with participating plans and providers to focus on their essential, shared requirements with a manageable degree of flexibility in accommodating some of the differences has enabled the CTP to progress without the delays that unresolved, competing priorities can create. • ICD-10 testing is a business commerce exercise with technical requirements, not vice versa. As important as technology is to successful ICD-10 testing, the actual transition is more a business-level transformation that affects finance, operations, clinical practice, and IT. The CTP ensures that organizations are testing beyond technical compliance and incorporating business concepts into their organizations. — Denny Brennan is executive director of the Massachusetts Health Data Consortium. — Micky Tripathi is president and CEO of the Massachusetts eHealth Collaborative.